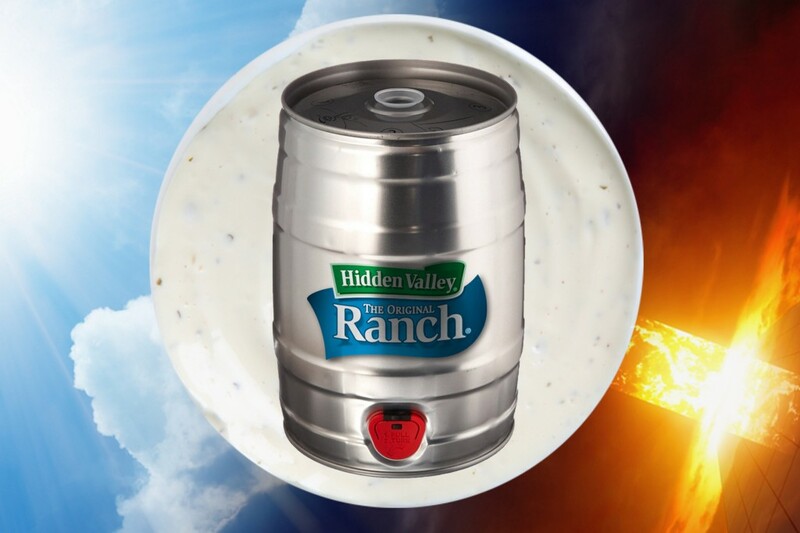 Is the Ranch Keg a Blessing, or a Crime Against God? Imagine my shock when the server met this blasphemy as a familiar request, pointing out a gigantic ranch-dressing dispenser next to the soda fountain. At a nearby table, a couple was already using some, the woman dipping her crust in it while the guy poured it directly onto his pizza. In the days that followed, I described the scene (and my horror) to friends, only to hear that this is common practice in California. Even worse, some people I thought I respected — both intellectually and morally — often do it themselves. To briefly lay out my own case against the “Great American Condiment”: No fresh salad — let alone a plate of chicken wings — is improved by the addition of this bland, chalky, fattening snot. Would I care to taste the original buttermilk dressing developed by Steve and Gayle Henson at their Hidden Valley Guest Ranch outside Santa Barbara in the mid-1950s? Absolutely, sounds fantastic. What I don’t want any part of is the bottled abomination developed in the 1980s by Clorox Co. after they bought the brand. The bleach scientists over there won’t say how they developed a dairy product that doesn’t need to be refrigerated, and that’s probably because the answer could incite a mass wave of vomiting that cripples our national sewage infrastructure. If I can’t convince you to stick with a vinaigrette, let the rest of the world: They’ve never heard of ranch. The few ranch products to make it overseas are “American”-flavored, which is just embarrassing. Hidden Valley’s ranch fountain — a mere $110, with a year’s supply of dressing included — was no less polarizing: A few were up to try it, should they encounter such a display, while a critic disparaged it as “one of the most unsanitary displays imaginable,” unfortunately glossing over the question of whether ranch is vile in itself. I suppose if ranch soda isn’t enough to make a country reconsider its debilitating addiction to this pasty white gloop, an ostentatious delivery system for it won’t do the trick either.